Production is not just limited to basic photo prints. SureLab printers will accept files from many common photo editing, graphic design and imaging applications. With appropriate software and the supplied Epson driver it is possible to produce a range of printed material including awards, invite cards, product fliers, restaurant menus, celebratory and event notices. In addition to traditional gloss and lustre paper, all models support output on matte stock with an additional A4 width specifically designed for production of photo merchandise and value-added artwork1. The SureLab range has been designed to simplify the installation process and reduce the costs associated with business integration. Unlike most competing equipment they do not use hazardous chemicals for the printing process. They do not require expensive ventilation, special consumables handling or waste disposal processes. They need minimal operational space and connect to a standard power supply. They generate minimal noise and can be operated in a wide range of situations including business, retail, home office and even mobile environments. The D700 is designed for stand-alone PC operation and connects via a high speed USB 2.0 interface (multiple printers can be connected to a PC equipped with appropriate USB ports). The D3000 is designed for shared operation and connects to Ethernet networks via a dedicate Printer PC4. Multiple D3000 printers can be combined on a network for scalable production and both models can be augmented with Epson Large Format printers for the ultimate in production flexibility. With the D3000 all commonly used consumables are loaded from the front and the printer features a large re-usable paper cut waste bin that is accessed from the left. In standard configuration it outputs prints to the rear with a retractable tray that holds up to 50 sheets. When configured with a sorter output changes to the front left enabling installation against a wall or in a corner. Designed as a floor standing machine, it has integrated casters for easy movement and can be desk mounted if appropriate considerations are made on weight. The D700 features a light and compact design that is small enough for transport to events and has reduced power requirements for operation on cruise ships, at shows and in mobile/ temporary locations. It has all front loaded consumables, waste management and media output to enable operation on a desk, on a shelf or in a kiosk enclosure2. 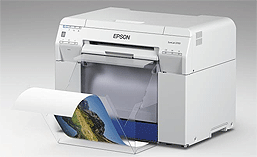 Both the D700 and D3000 can also be driven via optional Epson Order Control software. This product can be used either in addition or as a replacement to 3rd party application software. It includes a simple and functional interface that provides facilities for image upload, editing, pricing, production scheduling and control. It supports multiple SureLab printers and will also drive Epson Large Format printers for premium art, poster and canvas work. Adjusted files can be output to USB and disk storage using a standard PC drive or an optional Epson CD/DVD duplicator. 6Printer duty cycle ratings do not represent a warranty against the potential for individual part failure or a break-down in the printing system. When printers are installed, maintained and operated appropriately using correct Genuine Epson UltraChrome ink and Epson approved media they are covered (including print heads) with a 1 year on-site warranty. Cover can be extended up to a maximum total of 3 years through purchase of an optional Service Pack either at the initial time of purchase or within 365 days. Cover for options is 90 days unless purchased together with printers in which case warranty is extended to match the printer. On-site service outside of metro Australian &/or New Zealand locations may attract additional charges and all service is subject to conditions outlined in the Epson Australia SureLab Warranty terms. Figures are provided for comparison purposes only. They represent average and/or typical times based on internal Epson testing using a directly connected printer. Print speeds are based on a job containing 20 natural RGM jpeg images with 31 prints made borderless, computed from the time taken for the first print to exit to the last. Actual performance will vary depending on factors including image type, size and resolution, connection type, PC performance, environmental conditions, print mode, media type and size. Printer, Power Cord, 5m USB Cable, 200ml Ink set, 1 x Media Spindle, 1 x Maintenance Tank, Set-Up Guide, User Guide & Warranty Info, Windows & Macintosh Printer Driver & System Software on CD. The Photo Pack includes an additional Media Spindle, Standard Print Tray, Order Controller software, a Paper Storage Case, 2 x 6” Gloss, 2 x 8” Lustre & 1 x A4 media rolls. Delivery and installation is not included. If required it can usually be organised by Epson authorised Commercial Printer Dealers at an additional charge. Some assembly and configuration may be required and should be discussed with your dealer. Some proportion of the included ink will be required to 'prime' the printer and it is recommended that an additional set be ordered for production work. Support and Service is provided via authorised Epson authorised Commercial Printer Dealers. If you have a problem with a SureLab printer, a related option or consumable please contact your dealer for initial problem evaluation. Should a printer require service this will be provided on-site free of charge within the period covered by your Warranty and any optional Service Pack. Note: Provision of service and support is subject to Epson Australia SureLab Printer Warranty terms and travelling charges may apply for equipment located outside major metro areas or with difficult access. You'll need your product key to begin installation. Requires System Software and Administrator privileges. Printer must be in Ready state with the Paper loaded. The update takes about 2-3 minutes to complete. Extract the Zip File, Double click on the SL-D700_FW_Update.bat After completion of the update, the printer is automatically restarted, then the power LED lights up. Once the update's completed, confirm the FW version is CB415I1 on SL Printer Maintenance Tool.